Fissured heels are more prevalent in people who have dry skin, are on their feet for long periods, and particularly those who favour footwear without a heel cup e.g. flip-flops, ‘sling backs’, open backed sandals etc. 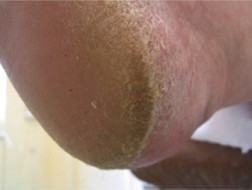 Fissured and thick callused heels are also more prevalent in people who are overweight. 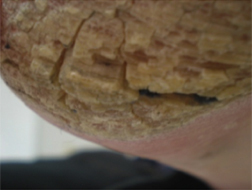 The fissures can occur as epidermal (restricted to the outside layers of the skin) or dermal (extend into the deeper layers of the skin). Heavily callused and fissured heels are treated by the use of scalpels and a combination of coarse and fine sanding discs. As is clearly demonstrated in these sequential photos below the improvement following treatment can be quite remarkable. If you are affected with unsightly thick/fissured/dry heels then make an appointment and come and see for yourself how we transform them. The difference is amazing!